US Senator urged China to shift from what he termed coercion and intimidation of neighbours to co-operation. Singapore: Influential US Senator John McCain said on Friday he feared for the consequences if China rejected an impending UN court ruling on the South China Sea dispute and called on Asian nations to back US statements that the outcome should be binding. In a speech in Singapore ahead of a key regional security forum, McCain, who chairs the US Senate's Armed Services Committee, said enforcement of the ruling of the Permanent Court of Arbitration at The Hague would be a major test for the region. The Philippines has gone to the court to contest China's claim to an area of the sea stretching deep into the maritime heart of Southeast Asia, covering hundreds of disputed islands and reefs. Vietnam, Malaysia, Taiwan and Brunei also claim parts of the sea. China refuses to recognise the case. 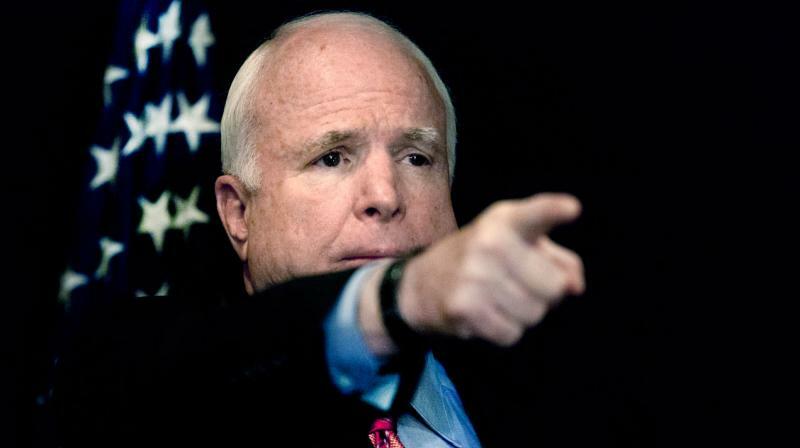 McCain urged China to shift from what he called coercion and intimidation of neighbours to co-operation. "China can choose to disrupt the rules-based order. Or it can choose to become a vital partner in maintaining it," he said on the sidelines of the annual Shangri-la Dialogue. "I fear the consequences if China chooses the path of disruption," McCain added, later saying it could force the wider region to cooperate more closely militarily and economically. The Arizona senator urged Southeast Asian nations to restate their support for a rules-based order. "America and the world are counting on the nations of Southeast Asia to recommit their power and resolve to upholding this system on which our shared security and prosperity depend," he said. Indian Defence Minister Manohar Parrikar, also speaking on the sidelines of the meeting, said New Delhi supported the peaceful resolution of the dispute. "We are very clear about our policy in the South China Sea," he said. "As (far as) India is concerned, we have always been insisting that all parties should resolve this peacefully based on the international laws and various other international norms." McCain said China "would be facing severe criticism from the world" if it opted to ignore the ruling of the court in The Hague, which is expected to rule in coming weeks. US Defence Secretary Ash Carter, who is leading the US delegation at Shangri-La Dialogue, is expected to make similar calls to Asian nations attending the meeting. In a speech at the US Naval Academy last week, Carter accused China of attempting to play by its own rules on the high seas, in the global economy and in cyberspace and warned that it could erect "a Great Wall of self-isolation" given regional concerns about its behavior. On Friday, to emphasize US concerns about maritime security in what is one of the world's busiest waterways, Carter took a flight on a US P8 surveillance aircraft along with his Singaporean counterpart. At a joint news conference, he urged China to participate in the rules-based order that the U.S. presence in Asia had helped maintain for the past 70 years and said Beijing had to make its own choices. "Obviously we hope it makes the choice of one that is cooperative with the system of security which has served this region so well for so long," Carter said.